If you require urgent care in Mid-Wilshire or anywhere else in Greater L.A., you might be surprised to know that one of the nation's finest practicing house call doctors is available to anyone who needs medical care. Dr. Michael Farzam of House Call Doctor Los Angeles is bringing back a style of compassionate, personalized medicine that many of us assumed no longer existed in today's often highly impersonal medical landscape. Dr. Farzam provides the kind of 24/7 urgent care Mid-Wilshire residents need, but in a manner few modern patients get to enjoy these days – at their home or office and on their own timetable. When you're sick, you're understandably in no mood to drive miles at to wait in a room filled with other ill patients at a standard after hours medical clinic or emergency clinic. Now, you don't have to. 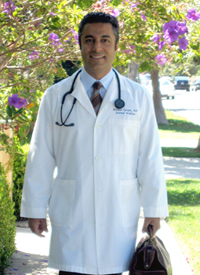 A respected board certified physician Dr. Farzam is doing more than simply bringing back old fashioned doctor house calls, he is combining the best of old fashioned medicine with the kind of fully up to date urgent care Mid-Wilshire patients need and expect. Dr. Farzam is known for his professionalism and skill as well as his warm and friendly demeanor. While many patients might tend to assume that a home visit will be extremely expensive, the fact of the matter is that, especially for patients with no health insurance, a house call visit is actually substantially cheaper than a standard trip to the ER. If you aren't feeling well and prefer to be treated at your home or office for any reason, your best move is to call Dr. Farzam at 310-849-7991 for the kind of urgent care Mid-Wilshire patients hope for. You can also get in touch with the doctor via his online contact page.